There is no doubt that Holy Stone is one of the best names in the consumer and professional drone production. It is rare to find a small drone that delivers to the satisfaction of the professional and beginner pilot. However, the Holy Stone HS230 RC Racing drone with FPV does just that, perhaps even more than that. It does not disappoint in terms of build quality and performance. Whether you are just beginning to learn how to fly a drone or you are the real pro, this drone is rich with features to make you enjoy the flying experience. Featuring First Person View (FPV) real time transmission, you can view the live footage of the videos and photos being captured. Even at its highest speed of 45km/h, this drone still captures incredible video footage. This drone comes in quite a compact and ultra lightweight design that makes it easy and convenient to pack for traveling. It weighs 116 grams only. All the parts are robust and long lasting. As this is a racing drone, the body comes in a streamlined design to minimize wind resistance, just like a racecar. It increases the sensation while in the air, which results to a better flying experience. Other than the quadcopter, the package also includes a transmitter, 3 batteries (2 for the drone and one for the controller), 4 spare propeller caps, 8 spare propellers, USB chargers, a card reader, screwdriver and a user manual. The Holy Stone HS230 RC is equipped with an efficient 720 HD modular camera with a wide 120 degrees field of view (FOV). This camera captures incredibly beautiful still photos and shoots high quality videos regardless of the speed at which the drone is moving. Video resolution is 1280 by 720P. The camera rotates enabling it to capture wide-angle pictures from various angles. This allows the camera to take beautiful landscape and scenery photos. The wide field of view also allows you to have a panoramic view so that you can obtain stunning all round images and video footages. A 4 GB TF Card is pre-installed for ample space to store all the images and videos that you take. However, this is not big enough, so eventually you will have to transfer the footages to other storage. The camera is easy to install and remove but you will still have to refer to the user manual. This drone comes with two 3.7V 750mAh Li-Po batteries together with their charging cables. When fully charged, each battery offers about 10 minutes of flight time. With two of them, you can enjoy about 20 minutes of uninterrupted flying time. A separate identical battery for the transmitter is also included and the batteries take about 60-90 minutes to be fully charged. The Holy Stone HS230 RC uses an advanced analog signal receiver and a 2.4GHz operating frequency to transmit images and videos swiftly and smoothly on the LCD screen. This allows you to view them in real time. To store more footage, you can find bigger and compatible microSD card. This drone has a headless security feature that prevents it from flying backwards or off course, which ensures that it does not get lost while in flight. It also has a low power alert that notifies you when the battery starts to drain so that you can fly it back home to avoid crashing. In addition, it is equipped with bright LED navigation lights that enable you to fly it safely at night. With the Holy Stone HS230 RC, you can perform many acrobatics on the air and you can also do 360-degree flips in all directions. You can impress your friends with your flying prowess. The drone has 3 different flight speeds – low, medium and high. For the beginners, it is best to start with the low speed. They can move onto the other speeds as they gain more skills. The advanced pilots will however fall in love with the high speeds, because it is a completely new experience. The drone’s powerful motors allow you to accelerate quickly until you reach the highest speed of 45km/h in a few seconds. The controller’s transmission range is 100 meters. You will love this controller. It is ergonomic in design such that your hands do not get awfully fatigued. The joysticks and other controls are easy to reach. The feature you will love most is that the controller has an inbuilt screen. From this, you get an excellent first person view of what the drone is seeing. Besides, this also means you will not have to use your smartphone. The controller comes with its own separate battery and USB charger for the controller is included. I acquired this small drone for its prowess in racing because I love a good thrill and so far, I have not been disappointed. I have flown it in 20 miles per hour winds and it has pushed on relentlessly without being swayed off course. I love my Holy Stone HS230. Ahmed S.
I almost missed buying the HS230 because I felt that it lacked many important features like automatic return to home and altitude hold. However, my friend who is a bigger drone enthusiast convinced me to buy it saying that I would never regret it. True to his word, I have not regretted having this drone. Ok, correction, I do not like the idea of giving it a ten minute rest between flights, but I still love it. Edgar K.
I must say that I love this drone, good price and all, but the videos are not exactly perfect for me. I find them differing in quality with some faint waves of distortion. However, I have not seen any other user complaining about this, so I guess it could be that I like to race this drone. Apart from that, I adore this drone. Anthony H.
I do not like a few things about this drone. One is the short flight time per battery. Try as hard as I can, fly it indoors or outdoors, I have never been able to coax more than 8 minutes of maximum flight time out of it. Second is the difficulty to fly it for the first time. Third is the lack of features like hiver mode. So why do I keep it? For the thrill of the speed, of course. Lenny W.
Who Should Buy Holy Stone HS230 RC? The Holy Stone HS230 RC is designed for serious racers. However, it still comes with features that can accommodate beginners and intermediate drone pilots. The more experienced users will love it for the advanced features such a high quality camera, high racing speed and the stunts it can perform. It has lower speed setting for beginners until they get enough experience to fly it at higher speeds. It is also affordable, has durable build and can withstand abuse. This makes and it ideal for all types of users. While you may use it for personal and family photos, it would not serve you very well if you are a professional photographer. With every feature that we have explained above, it is evident that the pros of this drone outweigh the negatives by far. It is built for speed and wind resistance, and it is very affordable. 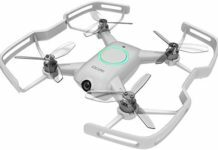 Besides speed, this drone also takes good footage and you can use it to shoot family photos and videos. If you are a drone collector, you must not miss this gem in your collection. Everything from its exterior features to wind resistance makes it every bit the predator that the manufacturer intended it to be. Besides, the Holy Stone HS230 RC will not leave a big dent in your wallet.